My thoughts: Full disclosure: The Old Man and the Sea is the only book I’ve read by Ernest Hemingway and that was many years ago. Despite that, I was intrigued by the idea of The Paris Wife. 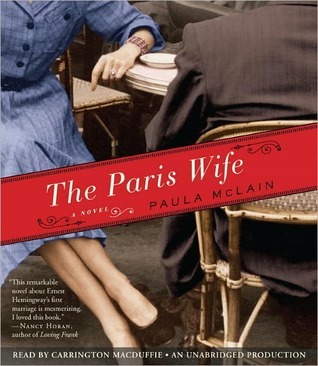 I found Paula McLain’s story of the author and his first wife interesting and rather addicting – I didn’t want to stop listening to the audiobook. I guess that’s also a credit to narrator Carrington MacDuffie. I thought the voice she gave the characters a bit dry but still easy to listen to. The story revolves around the Hemingways’ life in Paris and other European spots and includes their connection with several members of the Lost Generation – F. Scott Fitzgerald, Gertrude Stein, Ezra Pound to name a few. They lived and partied as if nothing else mattered but their happiness. Since we know that Hadley was Ernest’s first wife it’s not a surprise when the marriage starts to crumble. It was difficult to listen to the demise, though. If that part of the story was based on fact, I can’t believe what Hadley put up with until she couldn’t any longer. An epilogue ties everything up and inspired me to find out more about Hadley’s life after Ernest – which I plan to do! I’m glad I read McLain’s novel and hope to read A Moveable Feast in the near future. I’d like to read Ernest’s take on those times. Recommend? Yes, especially the audiobook.